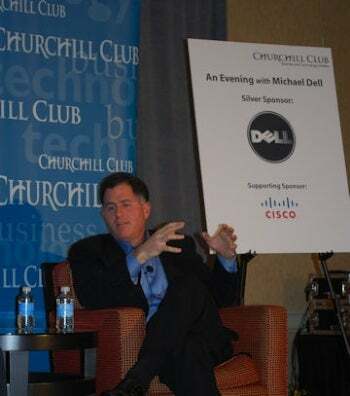 The Dell founder and CEO answered questions Tuesday night at a Silicon Valley dinner sponsored by the Churchill Club, where he also owned up to the "biggest mistake" of his career and described his company's plan to expand further into IT services. Asked about the rise of netbooks, Dell had not a good word to say. "Take a user who's used to a 15-inch notebook and then give him a 10-inch netbook. He'll say 'Oh, this is so cool, it's so lightweight.' Then 36 hours later he'll say the screen's not big enough, give me my 15-inch back." "A fair amount of customers" have been unsatisfied with the smaller screens and lower-performance parts, he said later. "For a replacement machine or for a high-end machine, it's not what we'd recommend." They were somewhat surprising remarks give that Dell sells a line of netbooks on its Web site. Asked by an audience member about his biggest mistake as an executive, he said it was sticking for too long with the strategy that had been working so well for Dell -- its direct sales model -- and not diversifying his business sooner. "We probably should have -- or could have -- intervened a bit earlier, and said we should hit the reset button here and try some new things to anticipate this challenge coming up," he said. Dell is trying to make up for that now. Last month it agreed to buy computer services company Perot Systems for $3.9 billion, in a move to help it compete better against rivals such as IBM and Hewlett-Packard. His goal isn't to emulate IBM and HP, he said. Those companies moved earlier into IT services and now have large businesses there. "We want to do this different to the other guys," he said, by offering more remotely managed services "instead of just throwing labor at it." He offered as an example physicians, who he said are finding it hard to move to electronic medical records. "It turns out software-as-a-service is a great way to build those electronic records systems online, and when we complete our acquisition we'll do that even faster," he said. Most of Perot Systems' business is in the health care market, though he suggested that will change. "Perot gives us a certain scale, but it's not so big that we can't materially alter the mix of the business," he said.